Heat oven to 350°F (325°F for dark or nonstick pans). Grease 2 (9-inch) round cake pans with shortening; line pans with cooking parchment paper. Make cake mix as directed on box, using water, oil and eggs. Pour batter into pans. Meanwhile, in large bowl, beat mascarpone cheese, 1 1/2 cups powdered sugar, 2 tablespoons cognac and the vanilla with electric mixer on medium speed until smooth. In small bowl, beat whipping cream with electric mixer on high speed until stiff peaks form. Gently fold whipped cream into mascarpone mixture until combined. To assemble, cut each cake horizontally to make 2 layers. 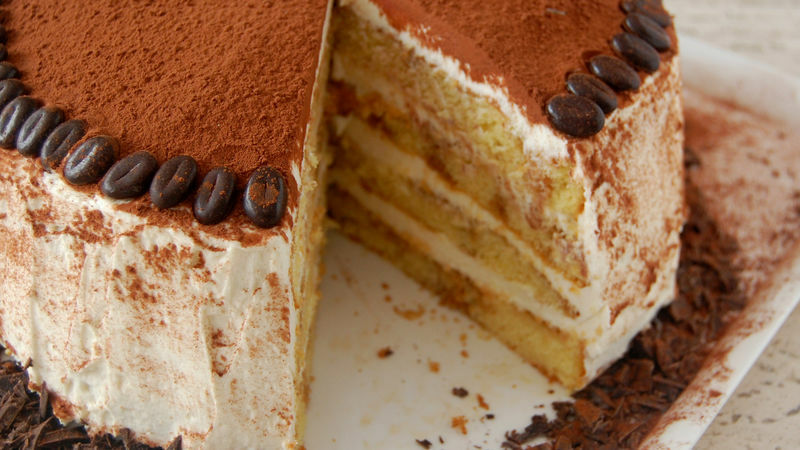 Place 1 cake layer on plate; moisten generously with coffee syrup, then spread with about 1 cup of the filling. Repeat with remaining 3 cake layers. Spread remaining filling over top and side of cake. If you have Marsala wine, rum or another type of brandy on hand, any of those can be substituted for the cognac. Avoiding caffeine? Use decaffeinated coffee in the coffee syrup. To make cake assembly easier, freeze the cake layers for 30 minutes first. To keep the cake plate clean, place strips of cooking parchment paper or waxed paper on the plate, then slide out the strips when you’re finished. This cake tastes better the longer it sits. For optimal flavor, make it 8 to 12 hours before serving.